Cryption for WordPress has been optimized for the Cryptocurrency Industry – perfect for building websites for ICO, ICO Advisors, Consultants and Cryptocurrency Agencies. Are you building a website for a Cryptocurrency business that is launching an ICO? Do you need a stylish business website for your digital consulting agency, crypto investments or BitCoin trading and investment business? Look no further than Cryption for WordPress. Tailored specifically for creating awesome looking websites that have been tweaked for SEO and Marketing dominance to help you attract the right investors and help your ICO reach its hard cap. 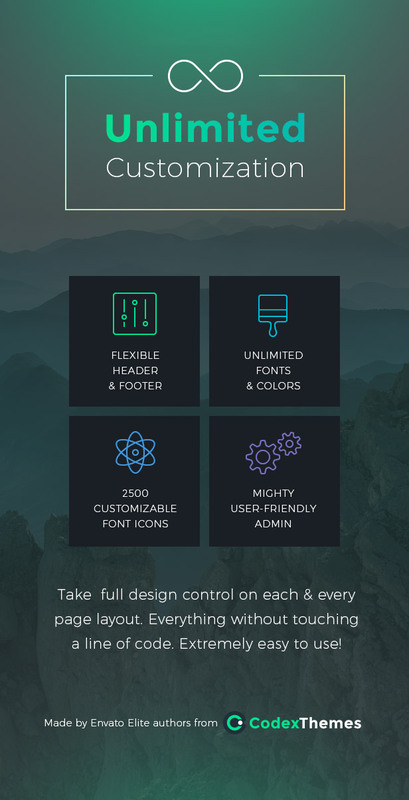 Backed by years of experience in building quality themes for WordPress, Cryption is the mastermind creation of the team behind best selling WordPress theme TheGem, trusted by 20,000 happy customers with a 5 Star Rating. 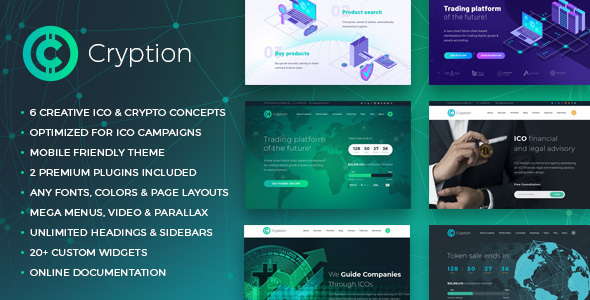 Cryption includes awesome premade ready-to-use designs and everything you need to create a stunning ICO Landing Page or a fully fledged ICO Agency and Advisory Business without any coding required. Including the best selling Slider Plugin, Revolution Slider, and the #1 selling Page Builder Plugin, WP Bakery Page Builder (formerly Visual Composer) was an obvious choice – saving you precious time and money as a designer, developer or website newbie. Drag, Drop, Edit, Publish. Done! Cryption features more than just a demo page to hook you in, every element has been carefully crafted to suit the crypto business model – whether that is and ICO, BitCoin mining, crypto mining, consulting, trading, private practise advisors business, or a crypto-powered marketplace – we’ve got you covered. Take a sneak peek! With over 60 content elements, unlimited layouts and a tonne of template pages to choose from, the functionality and flexibility of Cryption is unrivaled when it comes to WordPress Themes. A super high performance theme built on years of knowledge building and developing for WordPress, Cryption has not only been designed for ICOs, but it truly represents a virtual toolbox from which you can create almost any website imaginable. 4.85 average based on 27 ratings.